Running a blog can often feel like a full-time job without the full-time pay. The more time you put into your website, the more important it becomes to find ways to make money from it. Failing to do so could make it difficult to keep your blog afloat. Fortunately, there are plenty of methods you can use to monetize your blog. The potential for increased revenue can motivate you to create stronger content, leading in turn to new opportunities. What’s more, a regular income means you’ll have the budget needed to improve your site over time. 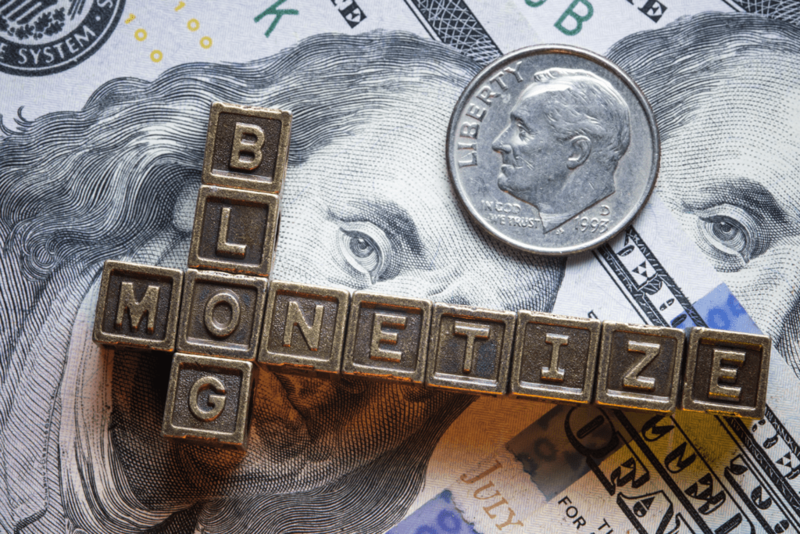 In this post, we’ll explore some of the ways you can monetize your blog content. We’ll also explain how to get started. Let’s get to it! Many people decide to move their careers online, in order to get more control over their working lives. However, this isn’t as simple as it may seem at first. Becoming a full-time blogger can take a lot of time and effort – particularly if you’re looking to actually get paid for your work. Although blogging doesn’t typically involve the same face-to-face interaction that a job in an office or a shop would, you’re still providing a service. This could be through the advice you give in your content, or simply by providing entertainment. Either way, it’s perfectly reasonable to want to earn some money in exchange for your work. Of course, it’s important to note that it’s also completely fine to run a blog without making an income from it. Monetization isn’t a requirement; it’s an additional benefit you can take advantage of it you’d like. So if you run a personal blog, there’s no pressure to try and generate revenue. However, you should be aware that establishing a career as a blogger will require you to make several upfront investments. These include your hosting plan, domain name, marketing campaigns, and any premium themes, plugins, and other tools you might need. These costs can become high when you’re working on a blog full-time, especially when you factor in your own time commitment. Not making any money in return may leave you unable to keep up with the ongoing maintenance and development of your site. Therefore, it’s usually worth at least considering your monetization options. Fortunately, there are plenty of ways to get paid for the work you produce online. Joining an affiliate program, for example, is a particularly popular choice. Let’s look at three more of the best monetization strategies you can use. One way to monetize your blog is by introducing members-only content. This is when you place some of your content in restricted areas, and charge users a small fee to access it. You can either choose to assign an individual cost to each post, or set up a subscription service. The latter will guarantee more regular payments, as users will be charged a monthly fee for an ‘AAA’ pass to your site. Plus, it’s often more appealing to readers than having to pay repeated one-time fees. As for the content you decide to restrict, it can be anything you like. You can lock away a large portion of your posts, or just a few special ones. Either way, your members-only content should be exciting and engaging enough to make the required payment seem like a good deal. This plugin will help you develop members-only content, and make it easy to integrate payment options with your site. As a new or established blogger using WordPress, it’s worth a look. Adding paid ads to your site is a very popular monetization tactic. However, you need to make sure the ads you feature will actually be clicked on by your readers. AdSense is a Cost Per Click (CPC) advertising program that places ads on your site which are relevant to your specific content and audience. These ads more likely to be clicked on than random messaging, which in turn means you’re more likely get a decent payout. To get the most out of your ads, you’ll first need to ensure that you know who your target audience is, and you’re creating content that matches their needs and interests. This will make it easier for AdSense to determine what your site is all about, and match it up to the right ads. You’ll also want to keep the AdSense program policies in mind when using the platform, in order to maintain a good standing. Finally, it’s a good idea to do some research into the best strategies for placing your ads, to ensure that they’re always displayed in optimal locations. In short, Patreon is a type of ongoing crowdfunding. Rather than getting a one-time payment from each fan (as with Kickstarter), creators receive regular payments from their ‘patrons’ as an encouragement to continue creating quality content. Each person can give as little as $1 per month, yet those small amounts can really add up. In return for their support, patrons typically receive small rewards. For example, you could offer exclusive posts that only patrons can access. This method is particularly effective for established blogs, who have built up a relationship with their readers. However, it can also work when you’re just starting out, especially if you have a pre-existing audience. Either way, simply ensure that the rewards you provide are worth the payment, and advertise the fact you have a Patreon account on your social media platforms. If your story and content are engaging enough, people may be tempted to see what you have to offer – regardless of the size of your current readership. Working on a blog full time is a common goal, as it grants greater freedom over both your professional and personal lives. By finding ways to monetize your site, you can ensure that you’re able to keep it running efficiently. This can help you turn your blogging dreams into a reality. Using a plugin such as MemberPress to offer members-only content. Adding highly-targeted ads to your site through Google AdSense. Setting up an account with Patreon and encouraging your readers to donate. Do you have any further questions about monetizing your blog content with these tools? Let us know in the comments section below!